Day 2 in Nevada was completely unplanned. I had spied Ward Mtn, a P2K, late the previous day and decided to pay it a visit. Atop Ward, I spied Egan BM, another P2K, about 10mi further south. So instead of heading into Utah today as I'd planned, I spent the day in the Egan Range that runs north and south from Ely, NV. And then I got the idea to head to South Schell the next day, so I'd spend yet another day in the area. Sometimes that's the way it goes when you don't have to be anywhere in particular. PB has various TRs suggesting that this one might be a drive-up if one is adequately equipped. I decided I was and drove up after I'd left Ely for the evening. Most of the drive had sufficient light, but the last 45min was in the dark, a fun exercise in driving the jeep on rough roads by headlight. The very last stretch was steep and loose, stalling the jeep in 4H. I switched to 4L and had to lock the rear wheels to get enough traction to make it to the top. I had hoped to camp at the summit, almost 11,000ft in elevation, as a way to beat the 90F heat back in Ely. The temp was cooler, about 66F at the summit, but I found no flat areas to camp. My car was perched at the edge of the summit with highbeams shining out into the nightsky to the east. The lights of Ely could be seen to the north and I wondered if my car could be spotted from below - it would seem odd, I'm sure. I ended up driving half a mile back down the road before I found a suitable location to spend the night. It did not take long to arrange my bedding and settle down for the night. It was still warm inside so I left the doors ajar until well into the night when things cooled. In the morning I walked the half mile distance back up to the summit so that I could take some photos about half an hour after sunrise. The temp had dipped to 53F overnight, but it hardly required a jacket after the brisk climb. The summit is rather blase - a small antennae is enclosed in a fence at the very top, a few sawed-off poles to one side. No register, no benchmark that I could find. Good views though. From the summit I spied Hamels Peak to the south a few miles which looked to make for a nice ridgeline hike. I walked back to the jeep and reparked it down the road further where it was more suitable to access the ridgeline to Hamels. I was in no hurry to drive back down to the valleys with more heat on tap, so I enjoyed the hour I spent walking the ridge (with a nice breeze blowing over from the west) to the bonus summit and back. No trail, but no bushwhacking, either, just your standard Great Basin sage and pinyon/juniper forest. The drive to Egan BM is quite long, taking me almost 2hrs from the time I had returned from Hamels around 7:15a. I used Google Maps to get me to the high saddle from the north, the only error when it tried to get me to drive through the charcoal kilns (they dead-end). There's an easy way around just to the south, but the road is pretty rough without high-clearance. 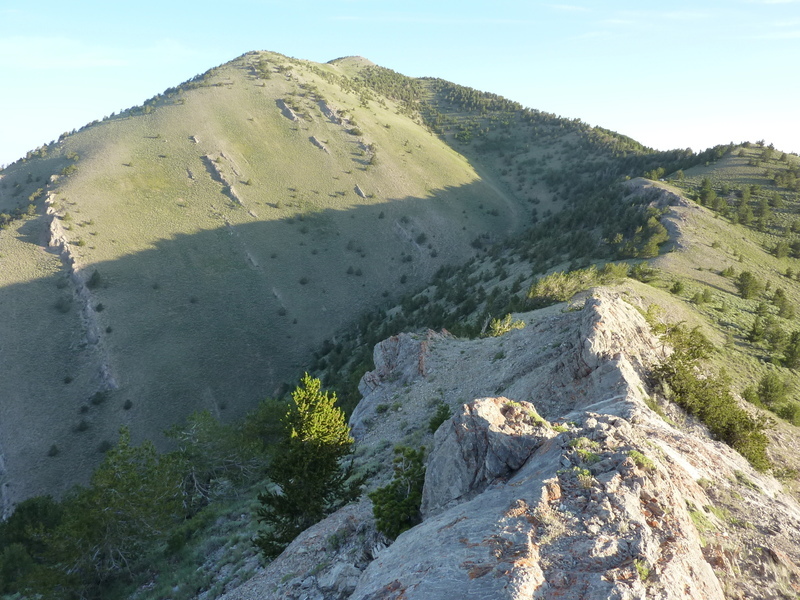 As Eric Kassan pointed out in his TR on PB, the route is quite scenic and I enjoyed it a good deal, especially the two high valleys on the way up to the saddle. After such a long drive, I decided I should spend more time up in this lovely area instead of just doing a surgical strike on Egan BM. The two nearest summits would make for a nice loop that would keep me busy for about three hours. Egan BM is about 1.5mi from the saddle I parked at, but it's possible to drive to within a mile on a spur road. I followed this spur road from the saddle, then sidehilled on the east side of the crest from where the road ended, slowly making my way up to the crest. It took about 45min to make my way to the top of Egan BM, the last 20ft or so some easy class 3 scrambling on limestone (most of the Egan Range appears to be limestone from what I've seen). There was the expected benchmark and a Gordon/Barbara register from 2003. Almost all of the names on the seven pages were the usual collection of prominence peakbaggers with a few locals for added flavor. I found my way back via a slight variation to the spur road I had hiked up, then struck off to the northwest for Peak 10,042ft, a climb of more than 750ft. Like most of the day's hikes, the footing was decent despite the steepness and gravelly slopes - limestone holds together much better than most other rocks, even when reduced to talus and gravel. From the second peak, I descended east into the canyon I'd driven up, which separates Peak 10,042ft from Peak 9,558ft. This meant a little more elevation loss & gain, but it was shorter than returning first to the saddle where I'd parked. The quart of Gatorade I'd brought with me would work nicely for the three peaks. The last summit wasn't as nice as the other two, not surprising since it's almost 500ft lower. The climb up from the west was a bit steep and loose, but helped by a deer trail I found zigzagging its way up. The hike off the summit to the southwest was a pleasant ridge stroll, and shortly after noon I was done.